Yesterday I was heartbroken to learn that Ray Harryhausen, the great wizard of stop-motion effects, had passed away at 92. Although it is inevitable in the end, we don't want our heroes to die. It seems impossible, since they've achieved feats that seem far beyond the means of mere mortals. I spent my evening reminiscing with people at Facebook, making new friends, and enjoying the flood of love pouring over the memory of this man. It was a celebration of a life well lived, not a funeral wake. The signed photo above hangs on the wall by my animation stage. Next to it is a photo of a scantly clad Fay Wray, and also a clipping from Cinefex magazine; a last tribute by his colleagues to David Allen after his passing. Fitting images of Pete Peterson and Jim Danforth will doubtlessly find their way there too. I keep that photo in the corner of my eye to remind me of what can be achieved, and what I should strive to live up to. A presumptious ambition to be sure, but I'd like to think it's a noble one. Growing up in Sweden in the 1970's and 80's meant that fantasy films weren't shown very often on TV. Thank goodness the classic "King Kong" was an exception. I had the fortune to see it on TV at age five, and it changed my life forever. With the advent of home video things changed a bit. I and my mom found that a nearby laundrymat had started renting out VHS video tapes, so we went there, and I picked out something called "Clash of the Titans". Again I was blown away by what I saw on the screen. 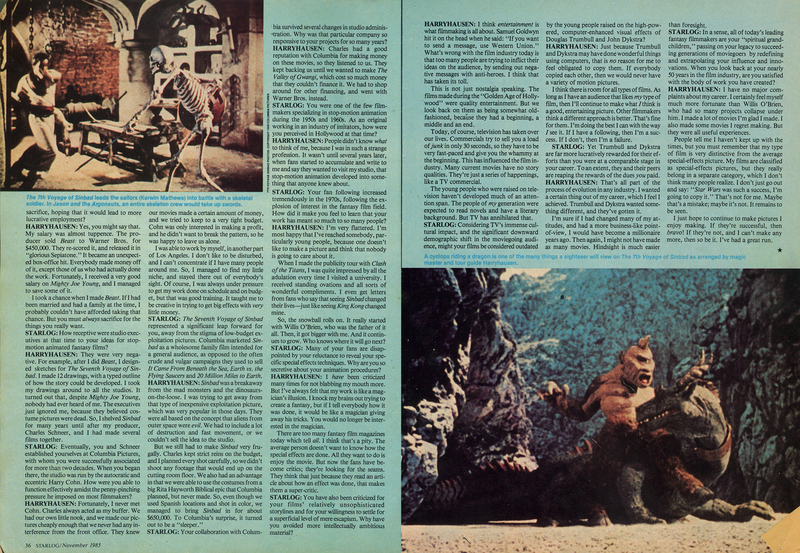 This time the epic effects were in colour, and the interaction between monsters and actors flawless and far more intricate than in "Kong". The fact that the subject matter was Greek mythology, which I was slightly obsessed with at the time, only added to the incredible wonder. Eventually I found a magazine called "Starlog" at a local magazine vendor, and faithfully bought a new issue every month. 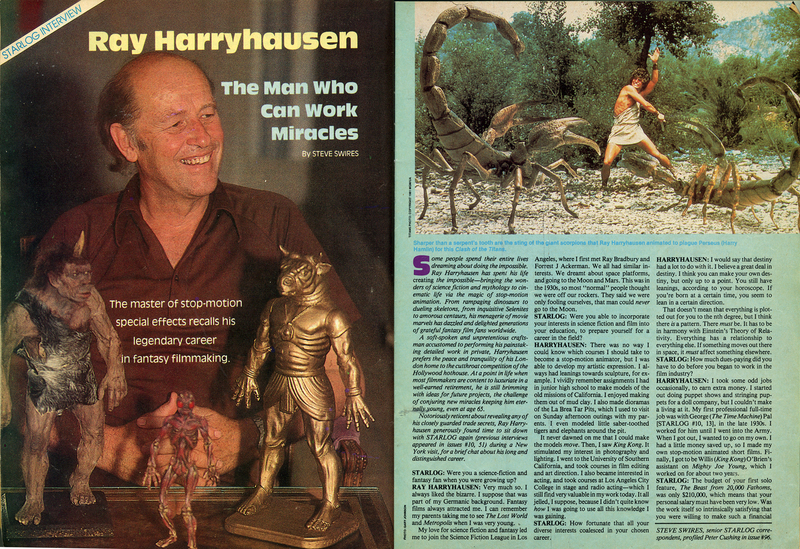 Starlog's celebratory 100th issue featured an interview with the enigmatic "Ray Harryhausen", and for the first time I got a proper look into this man's career. Some slightly blurry, but no less exciting photos aluded to a Sinbad film, as well as other movies. I set out to hunt them all down and somehow get them in my possession; something that wasn't an easy feat in the days of rental-only-video. Some time later Swedish TV screened "Jason and the Argonauts", and, finally, while visiting my dad who had just moved to the US, I raided Blockbuster Video for every Harryhausen tape they had. To say that those films influenced my life would be saying that a glass of water after walking through the desert was "refreshing"! They possessed my mind with a burning ambition to make films just like them, in any way and form I could. 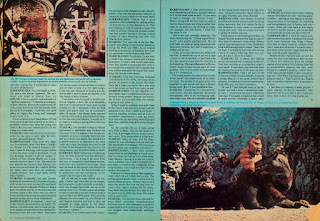 More Starlog articles followed, as well as research into the puppet-making and stop-motion animation crafts, usually via the now Starlog Group-published CineMagic. My dad also got me the first edition of Ray's "Film Fantasy Scrapbook" to include "Clash of the Titans". 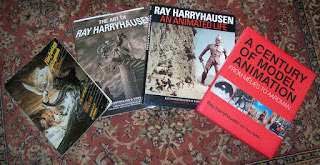 During this new millennia, Ray has treated us to a bunch of luxurious books dealing with every aspect of his life and career, as well as the legacy of many other stop-motion artists. 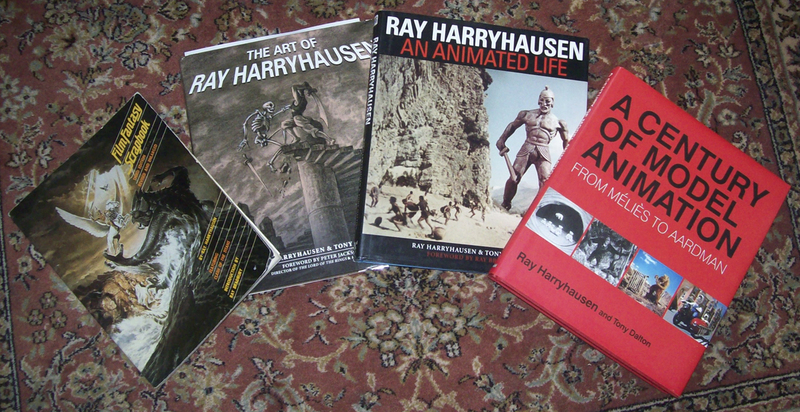 My edition of "Ray Harryhausen an Animated Life" is, by the way, signed by the master. Although I am only an amateur filmmaker posting my videos on YouTube, I like to imagine that I walk in "uncle" Ray's footsteps. I've come to realize that there are quite a few of us doing that, so I'm in good company. 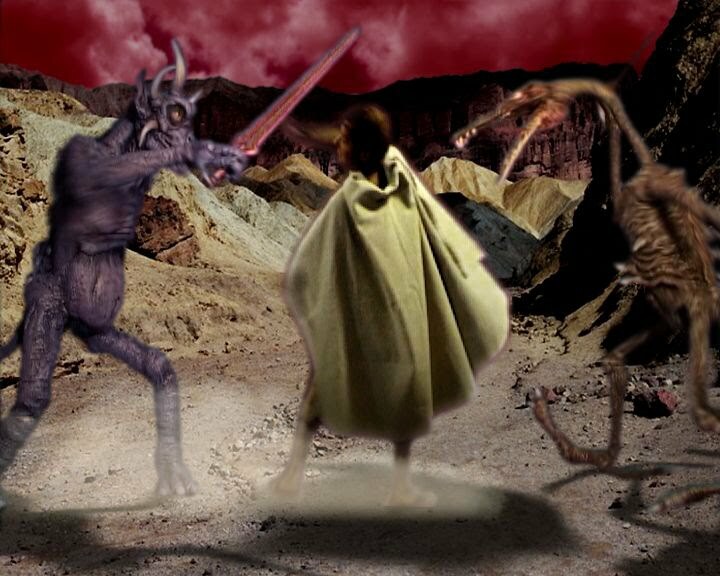 My own purest Harryhausen tribute is probably "The King Who Sought Immortality", which features a questing hero walking into set-pieces with monster encounters. However, only one of these scenes is a traditional Harryhausen-style battle, but done with all the zest that I and my main actor Dag could muster. The scene has a more than a slight nod to the multi-opponent skeleton fight of "Jason". Ray's passing has made me more than determined to continue my "hobby", as others like to call it, my passion, as I like to call it. It has also made me realize I have to pick up my slack if I wish to be a prolific filmmaker, even if it as as an unpaid, YouTube backyard-epic mogul. It made me realize that I haven't done my own Greek mythology epic -gotta fix that. I haven't made my own Arabian Nights epic -I actually have a script for that. I haven't made my own dinosaurs vs cavemen film -let's get to work! Let us not dwell on the "remakes" of Ray's "Clash of the Titans", as these films are insults in every way to both Ray and the moviegoing audience. 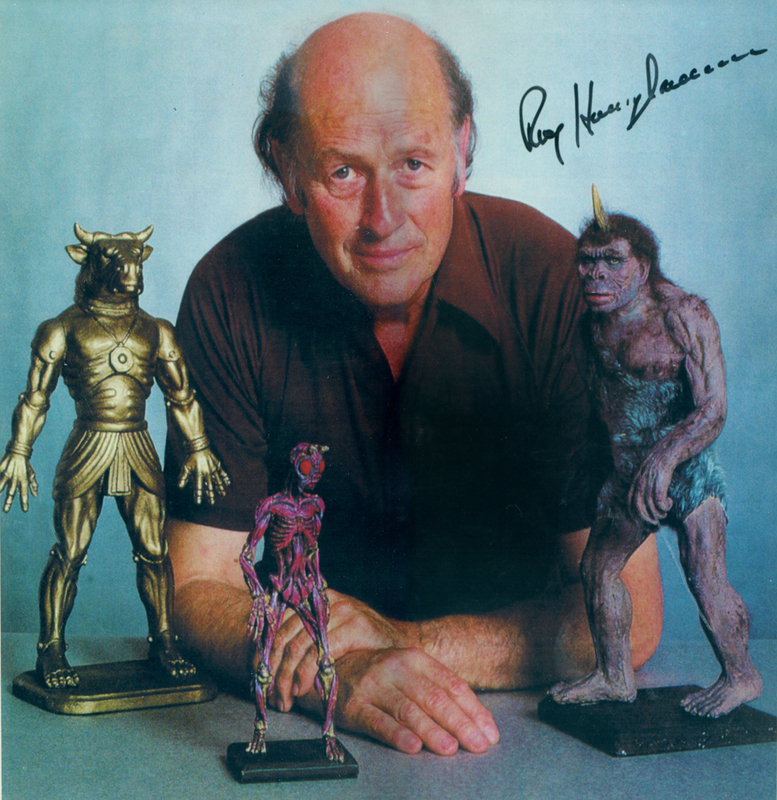 Let's instead consider the many "children" of Ray, and celebrate the incredible influence he's had on popular culture. Both George Lucas and Peter Jackson has admitted that no Harryhausen, no "Star Wars" or "Lord of the Rings" movies. The same goes for his influence on James Cameron, and the whole slew of amazing British animations, spearheaded by Aardman. The examples of master movie craftsmen and women are too many to list. 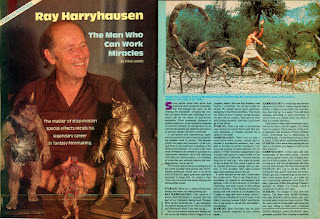 In short, Harryhausen is one of the most important figures in the history of entertainment. So many have been led by his example of excellence, and new aspiring fimmakers continue to discover him. Anyway, this has been my little tribute and walk down memory lane. Thanks Ray; my life would be so much poorer without you.